Tuber oregonense, known as the Oregon Winter White Truffle, is native to the Pacific Northwest of North America, ranging from northern California into British Columbia and is commonly found in Douglas Fir forests. 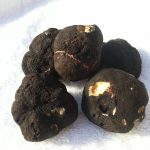 They are prized for their umami like and potent truffly or slightly garlic or diesel aroma. 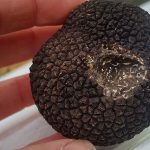 This white truffle is prized for its intense aroma and is used sliced, shaved, or grated over pasta, risotto, vegetables or eggs and also used to infuse butters, oils, and meats. Oregon winter white truffles are found from mid October through March. Oregon White truffles range in size but are generally on the small side, ranging from the size of a pea to a golf ball. We do occasionally find ‘icon’ size Oregon white truffles in excess of 2 ounces (about 60 g +). 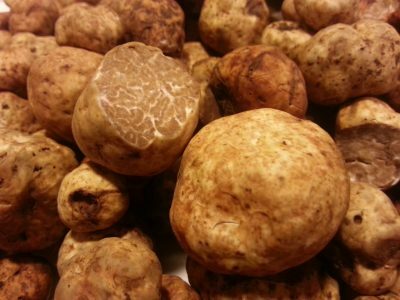 If you are interested white truffles of this size, please contact us directly to be notified when they are found. This product should remain frozen until just prior to use. Please note that this product MUST be picked up in person. We cannot guarantee shipping of frozen products for consumption. If you are looking for training truffles, we will ship via overnight via Fed Ex or USPS. We are currently experiencing a glitch in the system so please select “LOCAL PICKUP” as your shipping option upon checkout. We will separately invoice for overnight shipping. Domestic Shipping via USPS is approx. $35 per shipment for anything under 4 ounces. We apologize for the inconvenience and are working to solve the problem.